There was a time when all you could get was a straightforward wah effect. The available units had a treadle that left versatility up to your range of motion. Skillful and talented players did get a lot of use out of such pedals, but those who were just starting out were deprived of those possibilities. As the era changed and more brands started producing wah pedals, new and more powerful contenders emerged. And thanks to high competition, they are being perfected every single day. Ibanez, whose fantastic beast I am about to introduce to you, is mainly famous for its guitars and amplifiers. However, several of its pedals have deserved a great deal of fame as well. They all have certain features that make them stand out among the throng of units. 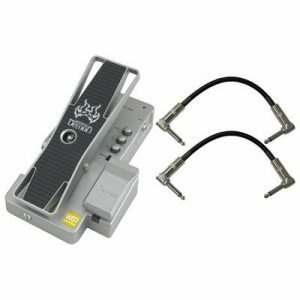 Weeping Demon WD7, in particular, is one of the best and most versatile wah pedals out there. It is built with ingenuity and depicts the intuitiveness of the manufacturer. Stay with me till the end, because by the end of the article, you will know everything about this wonderful device. I think it is time to get started, isn’t it? It takes just a glance to understand just how much Weeping Demon WD7 can offer. I will be honest, it is huge in size and might evict a pedal or two from your pedalboard, but once it mounts itself there, you will not regret a thing. The housing, internal components, cables – mainly all the constituents are made out of top-grade materials. The treadles are smooth and your foot will glide on top. Speaking of which, there are two different footswitches. One acts as an on/off switch for the Footswitch mode, while the bigger (a.k.a. main) can operate in Auto-Wah mode as well. This means that in the former case the effect is generated by pressing the footswitch and setting the treadle to the desired position, while in the latter you have to move the main treadle up and down to achieve the wah-wah sounds. And while we are on the subject, the smaller grey footswitch is also a battery compartment (can be powered with adapters as well). You also have the option to adjust the tension of the spring, which allows you to tailor everything to your preferences. The knobs here can be set to the desired settings, pressed into the pedal and locked. This way you eliminate the chance of changing the parameters or breaking the knobs when you accidentally bump into the pedal. One more thing I would like to mention is that Weeping Demon WD7 has the range control that makes it compatible with extended range and low-tuned guitars and basses. The cherry on top? It looks extremely cool and funky. Now you know why it is the most distinctive and diverse pedal out there. Weeping Demon WD7 definitely does not lack anything in terms of controls. In fact, it has way more than you would have think of. As I have already said, the knobs can be pushed into the pedal itself, which is a very useful feature, especially for gigging musicians. Apart from being secure, they are accurate and precise, and know exactly what to do. After all, they are the key to unleashing the inner demons this weeping beast hides. I will start with the encoders that are situated on the side of the big treadle. Level modifies the overall volume of the effect, while Q alters the character of the wah and intensifies its peaks and strength. Lo acts as a low pass filter and modifies the low frequency range without cutting them off completely. This way your sound remains full-bodied at each setting. Range switch offers two modes: Normal is best suited for guitars, while Low transforms the pedal into the low-range wah and tailors it to basses and 7 string guitars. There are two more knobs situated under the treadle. Range Fine Tuning tweaks the range even further and refines the frequencies, while Auto Off Delay sets the time of decay in the Auto-Wah mode. The lower the settings, the quicker wah fades away and vice versa. If you thought that Ibanez called this fella Weeping Demon for the sake of the cool name, you are wrong my friend. There could not be a better adjective to describe the sound of WD7. It can generate ethereal wahs on the clean channel, with more than enough range, depth and harmonic context. The effect is extremely defined and audible with each setting, saturating your sound with ear-bleeding squeaks, squeals, and shrieks. But the true potential of the pedal is unleashed when you plug it in with a distorted channel. That is when Weeping Demon WD7 turns into a monstrous unit that is just perfect for heavier genres. The controls allow you to access all the different layers and flavors of wahs, giving you more versatility than you will ever need. There is hardly any sound you cannot nail out of this one. And the best thing is, it works wonderfully with different instruments. It diversifies your bass wonderfully and retains the clarity of notes even at the lowest frequencies. It is not an exaggeration when I say that you will not think of another wah pedal once you get your hands on Weeping Demon WD7. Its noiseless operation and range of choices will leave it in your rig for good. Huh, what a pedal, right? Ibanez did a fantastic job at creating yet another powerful pedal. Weeping Demon WD7 is a truly sophisticated unit that can be of help to any musician. Those who like it simple, might not want to fuss around with its possibilities. But if you want to be steeped with sonic features and options, then you will not find a better unit than this one. Try out this bulky piece and you will be mesmerized. Good luck!